Question of the Week – What are some of your favorite beauty-related print magazines? Answer – I don’t have any. I look to my peers for beauty and fashion inspiration! Prime Beauty – chooses her Top 10 Must Haves for Summer 2013. Are any of them on your list? Phyrra – brings you the Top 10 Best Cruelty-Free Summer Beauty Products. we heart this – Have you ever tried Caldrea housekeeping products? Well, their Body products are just as fab, and we’re giving away a $116 set of six in the scent of your choice! Beauty Junkies Unite – Maybelline takes on an indie nail polish trend with the new Color Show Polka Dots collection shades that launch in July–but you don’t have to wait. Sneak a peek of the review & swatches now! EauMG – reviews 4 vegan floral perfumes from Sweet Anthem. Gouldylox Reviews – Ever wondered if Wen makes your hair fall out? I’ve got the answer to that and other burning questions! 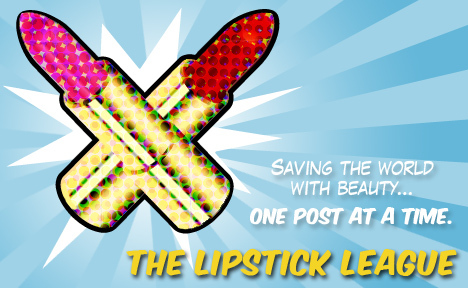 Lipglossiping swims against the tide with her distaste for Rimmel’s much-lauded Apocalips line, find out why she thinks they’re some of the worst lip products she’s ever had the misfortune to try! My Beauty Bunny – Inglot Cosmetics already won us over with their Freedom Palette system. Now they’ve tripled the fun with their Satin Rainbow Eye Shadows featuring a gradient of three colors each! Nouveau Cheap – Here’s your first look at all six of the new Wet n Wild Summer 2013 Limited Edition Pop Art Craze Eyeshadow Trios (if you like bright, bold colors, you’re going to love these). Pink Sith – takes you back to India with the new Lise Watier India Palette Eyeshadows. Six colorful shades with endless possibilities! Guest Post of the Week, as chosen by Prime Beauty – The Recessionista is a guide to all things beauty, fashion, style, food, wine and travel at a discount. I dare you not to love it!